Carsten Krieger is a freelance photographer and author based in the west of Ireland. He has written and contributed to numerous books on Ireland’s landscape, heritage and nature and undertakes regular assignments for the Irish tourism sector. He is currently finishing a three year project for the Burren and Cliffs of Moher Geopark. Peter Cox is a landscape photographer based in the south west of Ireland. He moved back from the USA, where he was following according to his own account a rather unsatisfactory career in computer technology, to his native Ireland in 2005. His dream was to make a living from landscape photography, a difficult goal in Ireland to say the least. 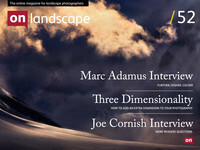 Although Ireland has produced several world-class landscape photographers over the past decade, many of them still have to make their main income from wedding and other commercial photography. Not so Peter Cox. He stuck to his vision and a few years into his professional career he opened a photography gallery in Killarney (in the middle of a recession I would like to add) and now, after 7 years in the business, Peter has published his first book The Irish Light, a collection of his best work to date with a foreword by no other than Joe Cornish. Nobody has ever doubted that Peter is a talented photographer and that he has made the right career move. This book however shows more than just the portfolio of a gifted landscape photographer; it also shows Peter’s evolution as an artist. When I met Peter for the first time he was just in the process of dumping his large format gear for a digital SLR. As he writes in his book he sees himself as a digital photographer and the move from film to digital was the beginning of a fast paced artistic evolution. Despite his love for digital Peter always admired the quality and precision of large format photography so eventually he went back to working mainly with a view camera this time however with a digital back instead of slide film. This ‘best of both worlds’ approach made Peter’s work really shine. The combination of the slow paced large format workflow and digital technology seems to work for Peter. As far as I am concerned Peter is both a digital as well as a large format photographer. If you compare the images in The Irish Light you will find not only the obvious difference in technical quality between the 35mm and large format images, there is also a difference in artistic quality. This doesn’t mean his 35mm images are poor or average attempts; images like Dún Briste, County Mayo or Carrick, County Galway are unique in both idea and realization. The images made with his Arca Swiss Rm3d camera are in a different league though and up with the world’s top class landscape photographers, just have a look at Poll an tSéideáin, Aran Islands, County Galway or Ross Castle, County Kerry. The self published book is divided into ‘Seascapes’ and ‘Landscapes’ and is a mix of colour, black & white and even infrared images in various formats. The content of the images is an equally wild mix and this adventurous approach is one of the things that make Peter’s work special. Beside the classic landscape photography themes of coastal sunsets (Mullaghmore, County Sligo), mist in the mountains (Cúm na Léime, County Cork) or even the clichéd Irish cottage (Abandoned House, Black Valley, County Kerry) there are also some more exotic contenders like a lunar eclipse (Lunar Eclipse, Gougane Barra, County Cork), the ISS and Shuttle Discovery in the Irish evening sky and some aerial and night photography (The Gap of Dunloe, County Kerry, Old Head of Kinsale, County Cork). Due to its location in the north Atlantic Ireland is more often than not dull, wet and windy. The motto for the Irish based photographer has to be ‘bad weather makes good pictures’ and Peter not only wholeheartedly embraces this motto (I actually have the impression that Peter’s happiness and creativity increases along with the wind strength) he also makes it work. The proof lies in images like Slea Head, Dingle, County Kerry, which is also the cover image or An Searrach, Dingle, County Kerry. For me the highlights of the book are the images Peter made on his visits to several of the Irish offshore lighthouses. The images of the Bull Rock Lighthouse and the Fastnet Lighthouse are of the kind you only see once in your life. Not many photographers get the chance to venture to those remote and hostile locations (both the Bull Rock and Fastnet are just a piece of rock in the Atlantic Ocean and inaccessible most times of the year) and to come back with a set of good images from these trips is truly an achievement. The only thing I find a bit disappointing is that the South Western corner of Ireland is very dominantly featured throughout the book and that the same locations appear more than once, Gougane Barra, County Cork and A morning at the office, Gougane Barra, County Cork are even made under almost the same conditions. But then again The Irish Light is a portfolio, it doesn’t claim to be a book on the Irish landscape and a good picture is a good picture no matter where it has been made. The Irish Light showcases a photographer who is just reaching the top of his game and I am looking forward to the things to come. If you have a soft spot for the Irish landscape and an appreciation for landscape photography this is a book for you. The Irish Light is available at Peter’s gallery in Killarney, County Kerry, Ireland and from his website www.petercox.ie.